This morning, we posted preliminary fundraising totals for candidates in public financing. But one of those reports was wrong because of a problem with the State Board of Elections’ processing software. This post contains updated information. Shortly after our original post, we received the following communication from Council At-Large candidate Hoan Dang’s campaign. Hi Adam, this is Jonathon Rowland, campaign manager for Hoan Dang. Thank you for the article this morning. I just want to correct the amount stated. When we filed with the Board of Elections, our report was duplicated because of a glitch in the system giving us double the amount of donations. We have been in contact with the Board of Elections since Monday to resolve this issue. The actual amount of donations is 316. When your author called Rowland for more details, he said that the Dang campaign found the error first and asked the board to correct it. Board staff acknowledged the mistake and said that they were working with their IT developer to fix it going forward. No public funds were ever distributed before the Dang campaign caught the mistake. Including information provided by Dang’s campaign today, here is the updated comparison of the five campaigns who have applied for public financing. Dang is not the leader in public financing. George Leventhal, who is running for Executive, is the overall leader in qualifying contributors and receipts. (Executive candidates get higher match rates than council candidates.) Among the council candidates, incumbent Hans Riemer leads in qualifying contributors and Bill Conway leads in matching funds. This should not discount a strong performance by Dang, whose financial numbers are not terribly different from Riemer’s. Going forward, we hope the state prevents the kinds of mistakes that affected Dang’s campaign. In the initial glitchy filing, Dang supposedly requested $148,328 in public matching funds. (Again, the IT glitch was not Dang’s fault.) In the updated filing, Dang requested $74,144 in public matching funds. That’s a $74,184 difference. If Dang had not caught the mistake, could that difference have conceivably been paid out? There’s no evidence available on that point. But for the good of public confidence in the county’s public financing system, we hope such a mistake never happens. 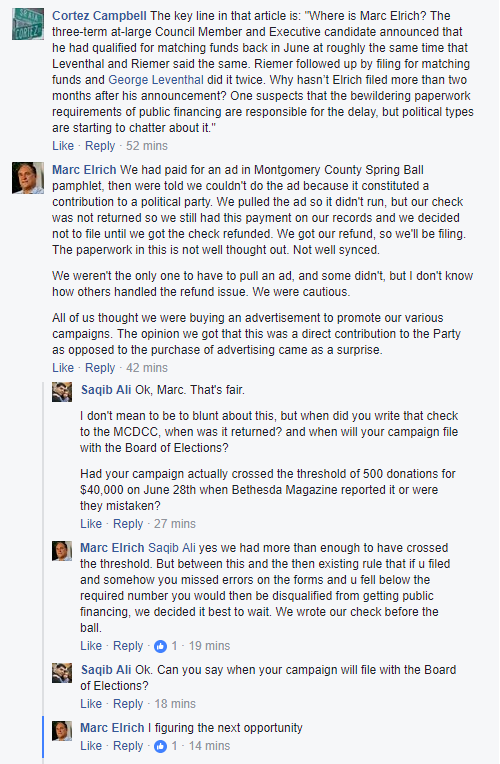 On a different issue, we asked what happened to Council Member Marc Elrich’s filing for public matching funds in our original post. Elrich said he had enough contributors to qualify back in June but has not filed yet. When asked about it on Leventhal surrogate Saqib Ali’s Facebook page, Elrich said his delay in filing was related to a payment his campaign had made to the county party, which was subsequently ruled to not be in compliance with public financing requirements. We reprint Elrich’s statement below.